KIEV, Ukraine -- Ukraine's president on Wednesday accused Russia of moving additional troops and military hardware into his country, a charge the Moscow quickly denied amid intense fighting in eastern Ukraine. Ukrainian servicemen take a rest at the barracks of a checkpoint near Debaltseve in the Donetsk region on Jan. 21. Speaking at the World Economic Forum in Davos, Switzerland, President Petro Poroshenko said the latest incursion presented “a grave danger for the escalation” of clashes in the east. “The situation is getting worse because now we have information that more than 2,000 additional Russian troops are crossing our border together with 200 tanks and armored personnel carriers,” Poroshenko said in a Bloomberg TV interview. He did not say when the incursion occurred. The troops and hardware were in addition to about 8,000 Russian soldiers and 300 tanks and armored vehicles already deployed in the country's coal-mining region of Donbas, he said. Russia has long denied any direct involvement in the fighting, and Foreign Minister Sergei Lavrov repeated the denials Wednesday. “We keep hearing all the time about ‘the flow of troops and weapons'” across the border into Ukraine, Lavrov said at a news conference in Moscow. Lavrov proposed that Ukrainian forces and the separatists pull back their heavy weapons to help reduce hostilities, a suggestion that received at least nominal agreement from his Ukrainian counterpart, Pavlo Klimkin. The claims and counterclaims of a new Russian incursion could not be immediately verified amid heavy fighting. Early Thursday, Ukraine defense expert Yuri Butusov said it appeared that the airport at the eastern city of Donetsk had fallen to pro-Russia forces. “The control tower, the old and the new terminals were completely destroyed and could no longer be protected without exposing our military to grave risks,” Butusov, head of the popular Censor.net online publication, said in an interview. A soldier told The Times in a message: "We have just left the new terminal, but we are holding on to a few other buildings on the territory. It made no sense to stay there anymore. The structure was falling on our heads." Western officials have from time to time reported Russian troops in eastern Ukraine, with a top NATO official in August saying at least 1,000 were present when separatists made a surprising assault near the Sea of Azov. Separatist leader Alexander Zakharchenko said at that time that 3,000 to 4,000 Russian citizens had come as volunteers to aid his force's cause. Observers from the Organization for Security and Cooperation in Europe issue a weekly account of the number of people crossing between the separatist-controlled areas and Russia. The reports don't identify those crossing as military or civilian but describe hundreds, and even thousands in some weeks, as wearing camouflage or other uniforms like those worn by Russian regular armed forces and mercenaries. An oft-violated truce reached in September between Ukrainian authorities and leaders of pro-Russia separatists broke down last week as fighting resumed along much of the separation line between the warring forces. The airport at Donetsk has been the scene of the heaviest fighting in recent days. Both sides claim to control the rubble that was the new terminal amid heavy casualties. Ukrainian Defense Minister Stepan Poltorak echoed his nation's leader, saying Ukrainian troops at the airport were battling not only separatists but also Russian troops. “Like back in August, in the [recent] fighting for the airport our soldiers inflicted heavy casualties on the enemy, killing from 300 to 400 Russian troops, including one general,” Poltorak said in an interview. 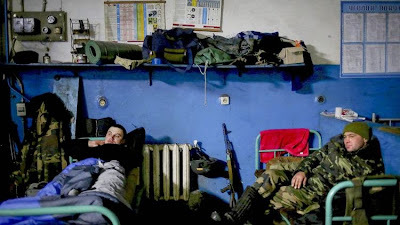 However, a separatist officer insisted that no Russian troops had crossed the border in recent days and none were involved in the fight for the airport. “Poroshenko can't put up with the fact that our self-defense forces are beating his regular troops, and to attract the world's attention to his plight he is talking about some imaginary Russian presence,” Eduard Basurin, chief political officer of the armed forces of the self-proclaimed Donetsk People's Republic, said in a phone interview. Basurin also insisted that the separatists were in full control of the airport grounds. The separatists and government also issued widely divergent casualty figures Wednesday. Basurin said his forces had killed more than 60 government soldiers and captured 16 more attempting to retake lost positions. The separatists suffered two dead and eight wounded, he said. Colonel Andriy Lysenko, spokesman for Ukraine's National Defense and Security Council, said at a briefing that one Ukrainian soldier was killed during the day and 40 wounded. He said that over the last four days the army had suffered 20 dead and 216 wounded. Presidential aide Yuri Biryukov said heavy fighting for the airport's terminal continued. “At some point earlier this week the terrorists got access to the second floor of the terminal, where they set up bombs,” he said in an interview. Intense fighting also resumed this week in the Luhansk region of eastern Ukraine. Separatists attacked two military checkpoints and on Wednesday blew up a strategic bridge, the private Ukrainian network TSN reported. Russia had recently amassed more than 50,000 troops “in full combat readiness” and hardware close to Ukraine's borders, the Ukrainian Foreign Ministry said on its website Wednesday. In his TV interview, Poroshenko called for international support for Ukraine. “You should believe in Ukraine because we are defending democracy, we are defending freedom and we are going not only to defend the territorial integrity but we are defending European, continental and maybe global security,” he said.